The so-called Edinburgh colonies are some of the most sought after properties in the city, with the average price for a two bedroom colony house reaching up to £250,000. When the properties were originally built, however, they were intended to be affordable housing for the working classes. From humble beginnings, the colonies have become a much loved Edinburgh institution, and remain popular family homes over 150 years later. Perhaps the best known colonies are the ones in Stockbridge, built in 1861, but the story of Edinburgh’s colony houses begins over 10 years prior to their construction. The Pilrig Model Dwellings Company was formed in 1849 by Reverend William Garden Blaikie, the local minister and renowned social reformer. He devised a scheme of 44 houses in four blocks, to be built as affordable housing for working class families, just off Leith Walk. The second set of colony houses were built a few years later, at Rosebank Cottages near Fountainbridge in 1857. Based on the Pilrig model, these colonies consisted of 36 two storey dwellings with – for the first time – the characteristic external staircase. Each property contained a living room, two bedrooms, a scullery and a water closet. It wasn’t until the formation of the Edinburgh Co-operative Building Company (ECBC) in 1861 that major development of the colonies began. The ECBC was made up of workers from many different trades, including stonemasons, joiners, plasterers and plumbers. The poor state of housing in the Old Town, and soaring prices in the New Town, meant that Edinburgh artisans were in desperate need of good quality, affordable housing. The ECBC set about building their first colonies at Glenogle Park in Stockbridge, and the 11 terraces were completed between 1861 and 1872. Offering an alternative to traditional tenement accommodation, the colonies were intended to be flats that felt like houses – so each family would have their own front door and garden. The co-operative nature of the ECBC is reflected in their motif – a beehive – and in the fact that workers could buy shares in the company, the dividends of which could be put towards purchasing a house. The colony houses cost between £100 and £130 to buy (with a £5 deposit), and shares in the ECBC were £1 each. Between 1861 and 1875, the ECBC built over 1,000 houses on five different sites across Edinburgh. Some of the colonies were associated with a particular industry, such as the Dalry colonies, which mainly housed employees of the Caledonian Railway. The Abbeyhill colonies also had a high number of railway workers, due to the development’s proximity to the railway line. At their height, around 7,000 people lived in the Edinburgh colonies, and each one had a strong sense of community. The community spirit continues to this day, with street parties, jumble sales and local events being held regularly, especially in the Stockbridge colonies. 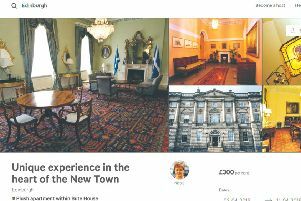 The colonies have stood the test of time and remain popular homes among Edinburgh locals, thanks to their solid building work, good layouts and private gardens – however, you’ll need a bit more than a £5 deposit to get your hands on one today.